Coffee at Cremosa Espresso Bar on Queen St.
Brisbane, like most cities, has a lot of cafes in the CBD. Most of them are also pretty boring. And what is even stranger, not all of them are open early. Fortunately for those who sometimes end up heading to work far too early in the morning, the Cremosa espresso bars are. Cremosa is a hole-in-the-wall style espresso bar at the bottom of the Aurora Tower on the corner of Wharf and Queen Sts. According to the internet the espresso bar opens from 6:30am on weekdays, though I am sure it was not that early the first time I was there. It is a little different from what you would expect in an espresso bar, as there is actually a decent number of tables just outside. Service and the coffee were both good, and certainly worth going back for. The coffee I had was made on a traditional espresso style blend, and Cremosa also serves single origins. 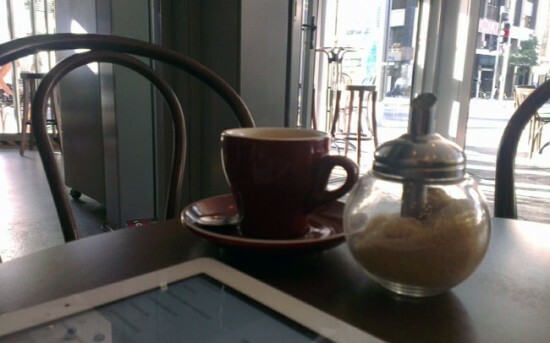 There are a number of Cremosa espresso bars in Brisbane, making it a rare decent chain cafe. If you were expecting a huge pile of fried meat to go with your morning coffee, I would imagine that Cremosa would, like any espresso bar, disappoint you. However, if you just want a good coffee I don’t think you would regret it.